Maybe you love the outdoors. Maybe you hate the outdoors. Either way you probably like a good laugh, a good cry, and a good adventure story. Fun, Brutal, and completely off the beaten path of most people's idea of going for a walk. This is thru-hiking, a weirdly balanced heaven and hell all at once. Physically demanding, and mentally exhausting at times, it is what it is. So pick a story and have a good read. Maybe I'll put you to sleep by the first page, or maybe I'll hook you. Care to try your luck? Read on if you dare, because long walks can be addictive. Pacific Crest Trail 2013: 2,650 miles from Mexico to Canada through California, Oregon, and Washington. 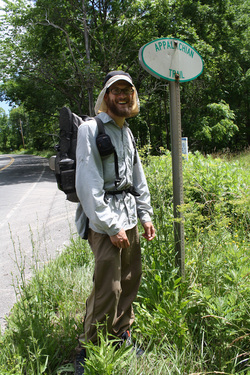 Vermont Long Trail 2012: 273 miles of rugged trail from the Massachusetts/Vermont border to the Canadian Border. New England Trail 2012: 215 miles from Long Island Sound in CT to the Massachusetts/New Hampshire border and Mt. Monadnock. Appalachian Trail 2011: 2,181 miles from Springer Mt., Georgia, through 14 states and ending at Mt. Katahdin, Baxter Park, Maine. Dublin's Wicklow Way: A Photo Tour of the 127km trip through the Dublin and Wicklow Mountains in Ireland. My "What-Not-To-Do" Primer for heavy pack hiking with zero experience - ill-fitting and heavy boots - and a general lack of having it all fit together perfectly ! !